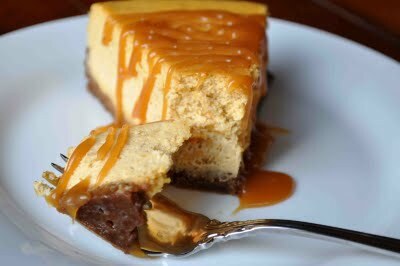 …pumpkin cheesecake with a gingerbread cookie crust drizzled with decadent caramel sauce. I would attribute this to someone if I could piece together all of the recipes I perused on the Internet, but the reality is that I ended up with something all my own. And it started with this collection of winter squash from my CSA farm. Now I know I called this a pumpkin cheesecake, but that’s only because pumpkin-delicata-sugarloaf was just too long. 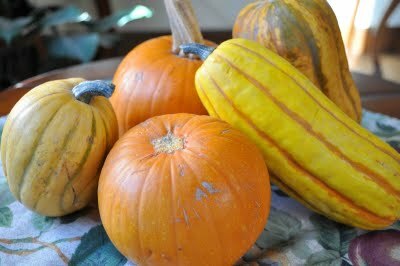 The reality is that most sweet winter squash such as these (along with butternut and acorn) can be used interchangeably in many recipes. 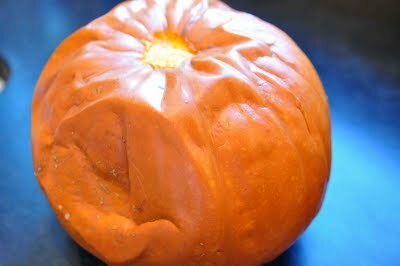 Just cook them all up until they are soft like this (make sure to put some knife holes in them before you put them in the oven so they don’t explode), then scooped out the seeds and harvested the pulpy flesh from inside. You can also buy canned pumpkin (not pumpkin pie filling, which is different) if you want, but what fun is that? …and measure out enough for the recipe. 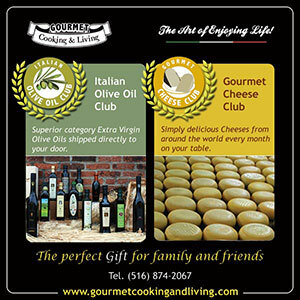 For me, it conveniently measured out to just enough for 2 cheesecakes – one for my feast and one for a new client I’m doing some “cheffing” for. Does this look totally worth the effort or what? 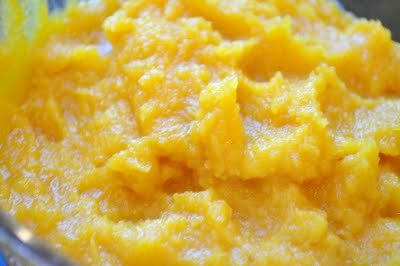 Pumpkin doesn’t have to be for Thanksgiving alone – this would be a fabulous holiday dessert or anytime winter dessert. It’s rich and creamy and a couple of bites will really satisfy you. But I’ll confess – I’m going to go finish this off right now! Preheat oven to 325 degrees F. Butter the inside of an 8-10 inch springform pan and line the bottom with buttered parchment paper. 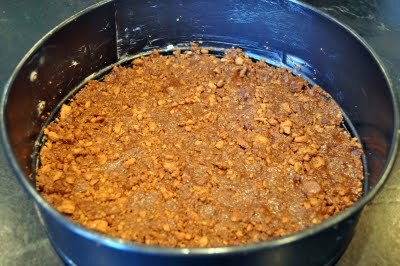 Combine cookie crumbs with sugar, butter and egg white, then press into the bottom of the pan. Bake until just set, about 8 minutes. Let cool slightly Mix together cream cheese and brown sugar until just barely smooth, then add pumpkin, ginger, cinnamon, and mace and mix on a low speed for about 2 minutes. Add mascarpone cheese and mix 2 more minutes to combine, then add eggs and mix until incorporated, about 1 minute. 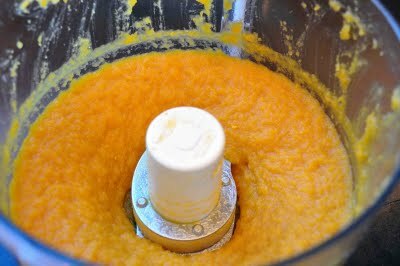 Scrape down sides after each ingredient is added to ensure even mixing. Pour pumpkin filling over the crust then wrap the outside of the springform pan with foil to ensure no water gets into the cheesecake while baking. Set in a large pan and place in the oven, then fill the baking pan with hot water until it reaches 2/3 of the way up the sides of the springform pan. 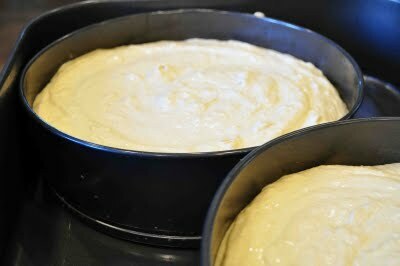 Bake until the center of the cheesecake is lightly set, about 60-75 minutes. Remove and let cool in the refrigerator for 8 hours before unmolding the springform pan. To serve, drizzle slices with caramel sauce. I made this recipe a couple of weeks ago, and it was a hit with folks who like pumpkin pie (me included), and just so-so for those who aren’t overly fond of those flavors. I substituted more cream cheese for the mascarpone and was pleased with the texture and the lower price of ingredients. 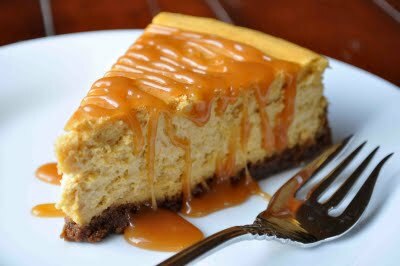 Next time I will cut out some of the sugar, since the crust is plenty sweet and the caramel sauce takes the sweetness over the top for me. I think I’ll try 3/4 cup next time. 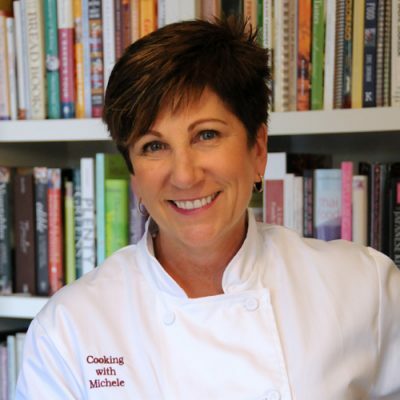 Thanks for the great recipe, Michele! Wow, great job here. Awesome picture too! 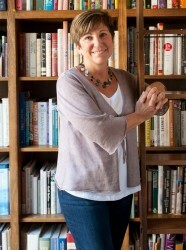 You should really consider submitting this to Recipe4Living’s Tasty Thanksgiving Recipe Contest – http://www.recipe4living.com/articles/the_tasty_thanksgiving_recipe_contest.htm – It looks delicious! Looks perfect! Thanks for sharing the link!